Ade and I popped along to the Hampton Court Palace Flower Show yesterday to get our fix of foliage, fragrance and all things floral. 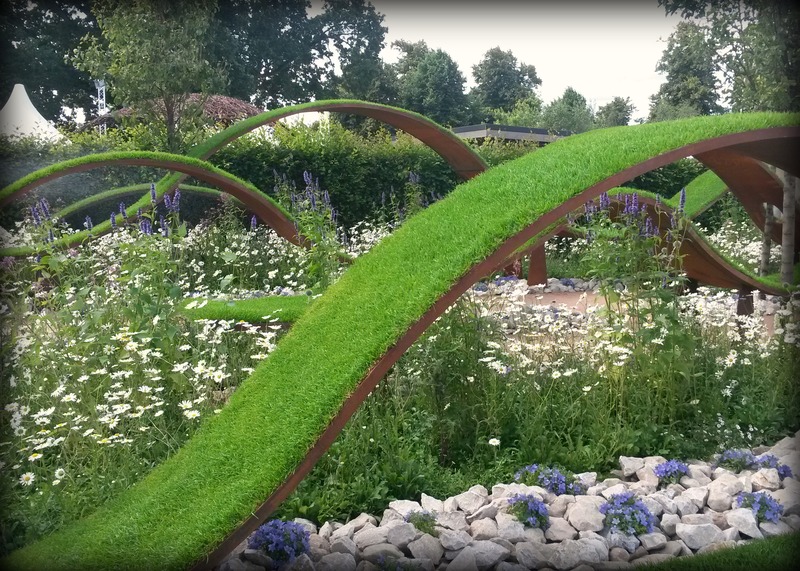 Of course, it’s the show gardens that are the big draw, and I’m always keen to see the conceptual gardens; living art installations designed to challenge and provoke the visitor. Striving for Survival by Holly Fleming is a particularly arresting design which aims to raise awareness of cancer survival rates. Lush planting at one end contrasts with 97 stark, stained branches which represent the percentage of pancreatic cancer sufferers who lose their battle within five years of diagnosis. Inner Demons by Amanda Miller is another evocative piece, featuring a rocky island dense with thick alpines and surrounded by murky water, depicting the isolation of depression sufferers. But the garden everyone is talking about is the gold award-winning Border Control. Designed by Tom Massey and John Ward and sponsored by The UN Refugee Agency, the garden highlights the plight of refugees and the risks many take to find shelter. I heard a little about this garden before I arrived at the show and was very curious to see it. 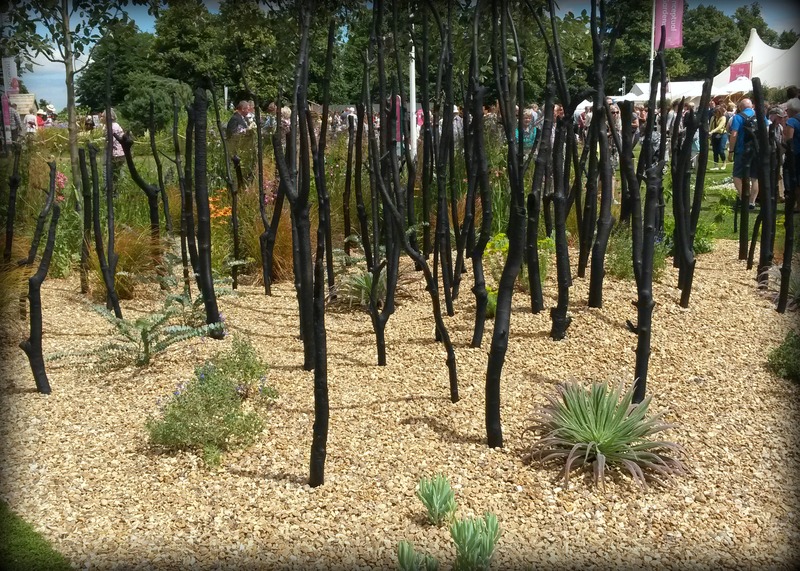 With its bleak design and minimal planting, surely it was the very opposite of a garden? I wondered what place it had at a garden show such as this one. 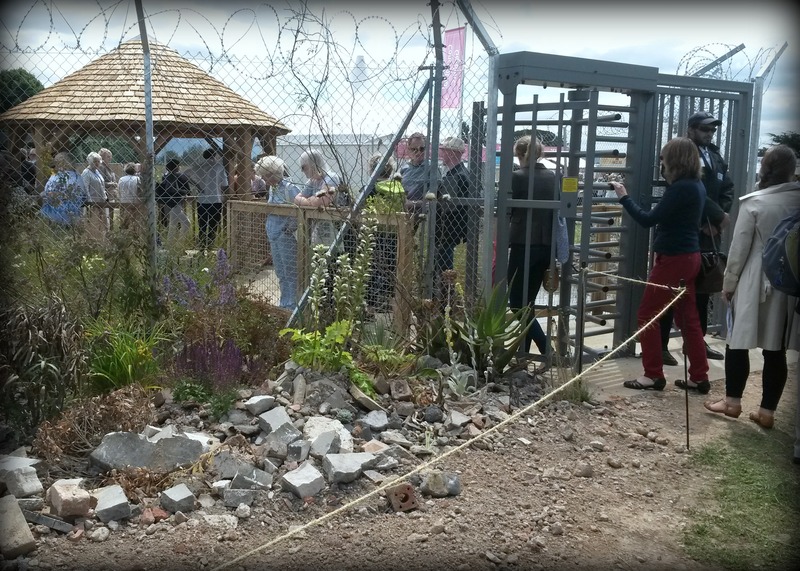 You approach the space via an area of rubble and dying plants, ostensibly a war zone, prohibited from the sanctuary beyond by a razor wire fence. There is only one point of access through a turnstile, beside which a security official ominously stands guard. Entry is permitted after you have been handed a wristband. Shuffling in line through the turnstile you traverse a moat, passing a wildflower meadow before finding shelter inside a gazebo. It’s an uncomfortable experience and it certainly makes you think. 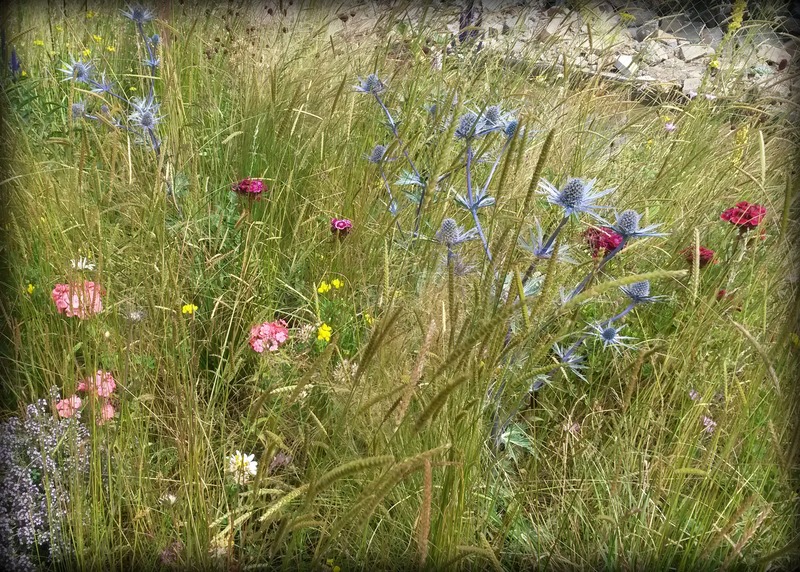 Any qualms I had about it not really being a garden were quickly dispelled; the wildflower planting is beautiful as well as extremely clever, combining native varieties alongside non-native, exotic wildflowers. But I found it troubling in other ways. 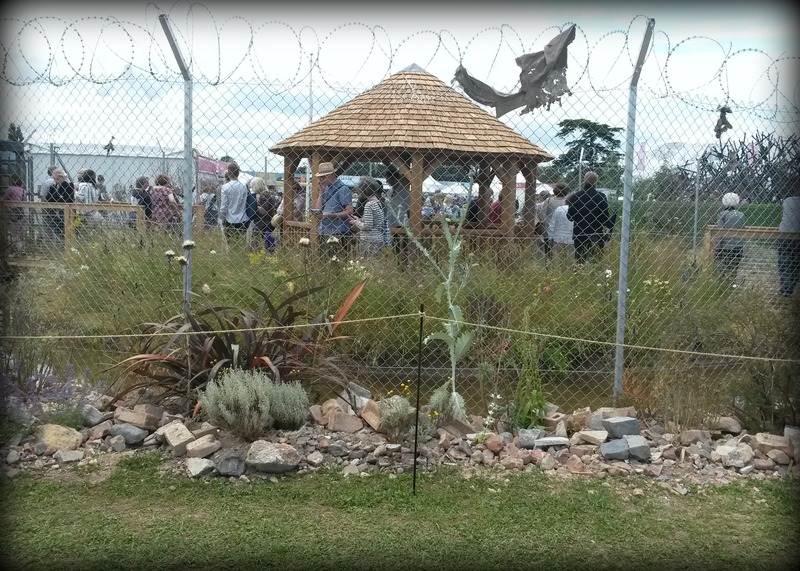 I wondered if it was wrong to shrink a horror so unimaginable as the refugee crisis to a mere exhibit at a flower show. Was it deeply patronising to have well-heeled spectators role-playing as refugees for a jolly, before jumping back in their Land Rovers and returning to their country estates? As I neared the exit on the far side of the exhibit, a woman with a Prada handbag slung over her shoulder chirped to her friend, “Wonderful, so interesting!” after which I imagined her slinking off to the champagne tent for a glass of Bolly, instantly forgetting everything she’d just seen. Sponsoring a garden at the RHS initially seemed to me a rather bizarre use of the Refugee Agency’s resources, but on second thoughts (I later recalled that I had to hand over my contact details to them before being given a wristband to enter the garden), I think they’ve been incredibly shrewd. 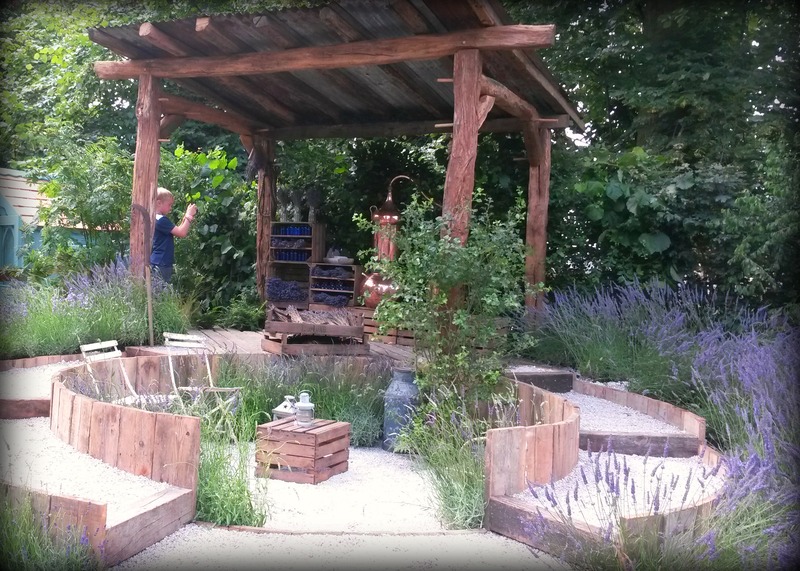 RHS Hampton Court Palace Flower Show is exactly the sort of place they should be directing their awareness campaigns, and the sheer incongruity of building a refugee shelter within the grounds of an English palace was worth the gold medal alone. There was lots to see and lots to think about. We certainly prefer the vibe of Hampton Court over Chelsea, and it’s well worth a visit if you fancy perusing gardens that go beyond pretty design (although there’s plenty of that too). 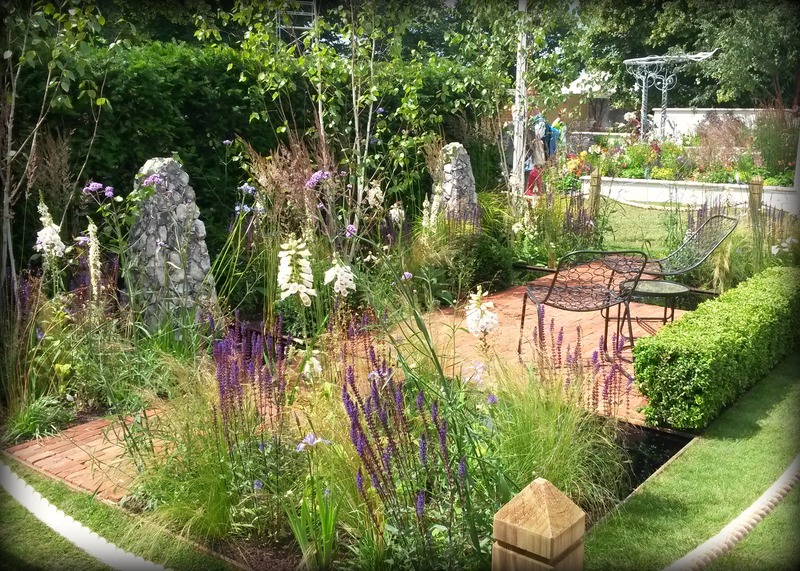 RHS Hampton Court Palace Garden Show runs until Sunday 10th July, more info here. Wow. Powerful stuff I wouldn’t expect to find at a flower show. Would love to be able to attend some year. Doubtless some critics have their undies in a bundle that it’s not just all pretties. I hope Holly Fleming’s entry is a sign of rising awareness about pancreatic cancer that might lead to better detection and treatment. I’ve lost two family members to that SOB in the last few years. I’m very sorry to hear that, Mark. Do you think you might be able to get along to a flower show this year? Where are you based? So interesting to think of gardening as a political statement. But why not? Who says gardening (or art) has to be one thing? As for some people not getting it…we have a saying in the states: You can lead a horse to water, but you can make him ( or her!) drink. It’s usually applied to more everyday things, but I think it applies here as well. Some people will not get it. But you did. And I expect many others did, too.